Good for: People who like to eat. Not for: Someone on a diet (you're getting them indulgent foods, after all!). What to go for: This is your chance to put together a really personalized, special gift. Buy a basket, fill it with goodies you think the recipient would like, and decorate it to your heart's content. 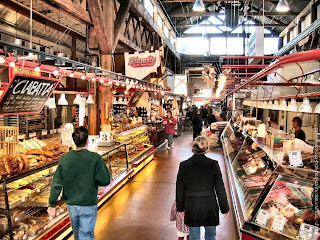 I like the idea of shopping local public markets such as the Granville Island Public Market--special teas and spices, gourmet fudge, pastries, cheese, olives--yum! For more adventurous palates, try visiting ethnic food stores like T&T, H-Mart, El Comal, or Fujiya and fill your basket with goodies such as Korean roast seaweed, pickled jalapeno peppers, or miso soup mix. The expert bakers among you can make special packages of cookies or squares for your baskets. Lastly, make sure you know about any food allergies or dietary restrictions (e.g. diabetes, low-sodium foods only) the recipient may have beforehand. wow i've never thought about this - this is a great idea for people who like to try different kinds of foods! Food hampers are a favorite of mine. I gave it to my boyfriend's family the first time I met them, rather than try to pick out individual gifts for people I had never met before. Mmm love visiting Granville Island's food markets! This city definitely needs more open air markets. Btw: You have been tagged, darling! See my post today for the "rules" - it's a fun one! great idea, what a lovely post! I love food....so anything edible is better than something I will never use. true. food will always be appreciated. i like to give wine, cheese or chocolate. Thanks for passing by my blog ! Food is definatly a yummy gift! I am planning to give people some specialty teas this Christmas (Insprired by your gift to your host while in Paris). It is hard to buy books/CDs or clothing when you don't know someone well enough. But, everyone needs food! Nancy, babe, you're in an ideal position to get people specialty teas as gifts considering you're in PARIS!!! Fauchon has a great selection.